Mayor Libby Schaaf of Oakland: Tell Friendship City, Pyeongtaek, South Korea, That We’re Opposed to the Torture and Consumption of Dogs and Cats. Pyeongtaek became Friendship city with Oakland on October 6, 2017. In Pyeongtaek, there are countless dog farms, slaughterhouses, markets and restaurants where the dogs, who are tortured their entire lives, end up being slaughtered in the most inhumane ways, such as by electrocution, hanging or beating; and then thrown into boiling water – sometimes while they are still alive. In many places, dogs are being killed in full view of other terrified, caged dogs; and this takes place in public and in broad daylight. In addition, many abandoned and stolen former pets end up in this industry, and are subjected to the same cruelty. Photo: Oakland North. Oakland Mayor Libby Schaaf (left) shakes her hands with Pyeongtaek Mayor Jae-Kwang Kong at the ‘Friendship Relation City Signing Ceremony’ held at City Hall. A Search Engine reveals the sickening scale of Pyeongtaek’s dog meat demand. 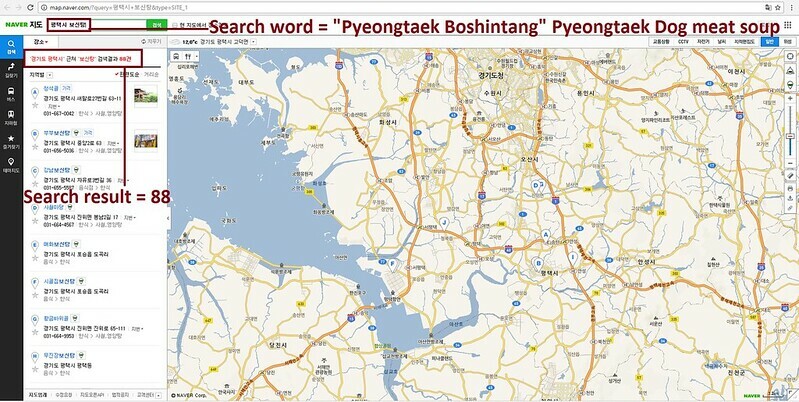 The searches resulted in: 175 Health Food Shops; and 88 restaurants in and around Pyeongtaek. 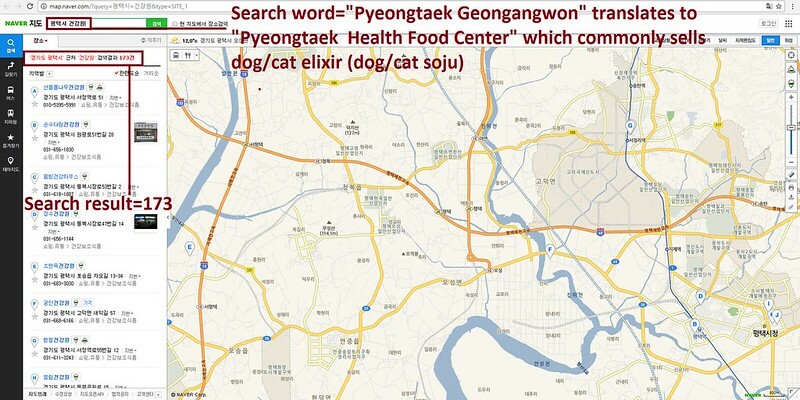 Even if half of these ‘Health’ Food Shops and restaurants serve dog and cat ‘ingredients’ in one form or another, just imagine how many dog/cat slaughterhouses must be present in and around Pyeongtaek in order to supply all of these outlets. Please sign petition, call, write and email the Oakland Mayor TODAY! Subject: Mayor Libby Schaaf of Oakland: Tell Friendship City, Pyeongtaek, South Korea, That We’re Opposed to the Torture and Consumption of Dogs and Cats. Hello, I’m calling to speak to someone in the Mayor’s Office to ask for their help on an important issue regarding your Friendship city, Pyeongtaek in South Korea. So, I am asking you to please speak with your counterparts in Pyeongtaek to urge them to enforce their own laws, not ignore them, and to show compassion to their companion animals, and also respect to their own citizens, by bringing these trades to an end. No matter where you live PLEASE SHARE these actions with your friends – especially those who live in Oakland! I don’t see any scientific proof that the more you torture an animal to death the better the meat taste. Any being that is tortured to death is at the hands of the devil. These type of people should be taken off of the streets and put into a mental institution. Any one that has the power to change this and does nothing is just as sick as the people that torture these innocent dogs and cats. Since Dogs and Cats are not listed as a regulated livestock animal in South Korea, there are no laws requiring the humane slaughter of the species for meat. If South Korea continue’s to eat dogs and cats there needs to be a law that protects Dogs and Cats from being tortured to death. The righteous care for the needs of their animals but the kindest acts of the wicked are cruel. [Proverbs 12;10] Will you please give these Dogs and Cats a voice??? My sincere thanks if you can help. “Are not five sparrows sold for two cents? Yet not one of them is forgotten before God. [Luke 12:6] God never forgets them even after being sold in the market and killed. Will you help stop this horrific torture of these innocent Dogs and Cats? This dog torture is horrendous and needs to end immediately! God will be the final judge…This was not meant to be. These dogs and cats are intelligent and they are used to be companions and help those with disabilities and serve and protect us… What are we doing??? We must help them and shut down this evil industry. These people are monsters and I believe they are possessed by the devil and are going straight to hell! These are loving animals and need to be loved and protected… They only know unconditional love…. Absolutely agree with Dawn. We are all being watched and our sins remembered. Any man who tortures and abuses any of his fellow creatures- large or small, fur, feather, or human- will not be looked upon favourably in the next world. Change your evil ways if it is not too late already.